Sorry I haven't posted very much recently. I haven't been idle, but I was working on a few Christmas gifts (including a kilt for my two year-old nephew) that didn't pertain to this blog. Anyway, next on the lineup is a frock coat. Once again, I drafted my own pattern, based this time on a combination of drafts from R.I. Davis' Men's Garments, 1830-1900.The collar is my own design, so we'll see how it works out. I just haven't been able to successfully draft a collar based on any system I've seen yet, but the second version I made for my muslin version of the coat seemed to work out well. As you can see, there are three pieces - the main canvas, and then two additional pieces which reinforce the shoulder and chest. I cut the main pieces and one of the additional pieces on the straight grain, and the second shoulder canvas on the bias. Here are the main pieces and the collar canvas pieces. I could just go from there, but the next step is to shape the canvas so that it is more three-dimensional, and not just a flat piece. In order to do that, I took the dart out of the neck gore/lapel that you can see drawn in above, and then opened up several V's (what's the opposite of a dart? That's what these are) as you can see below, and inserted fabric to keep them open. As you can see, the lines start to flow and the canvas no longer lies flat on the table. Now, after I've added the two shoulder/chest pieces (which have similar V's inserted into them) I pad stitched them all together. 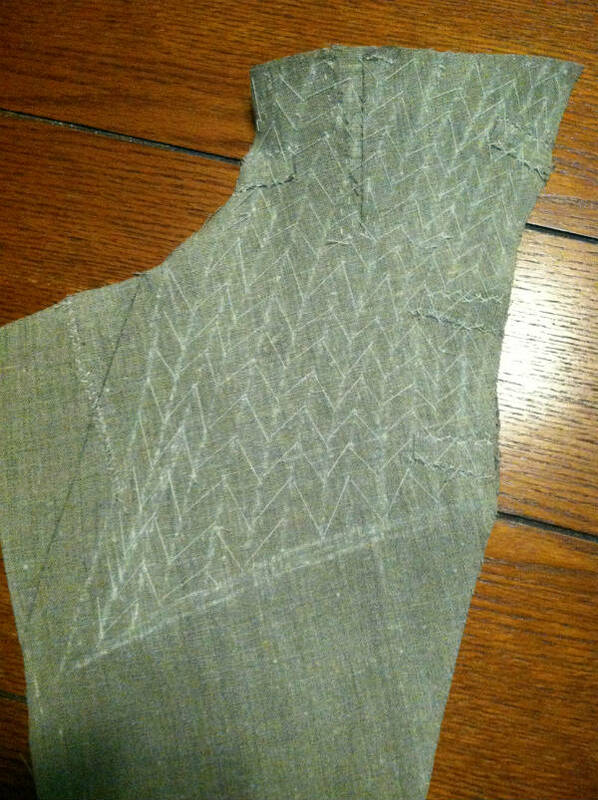 The vertical white lines are chalk lines to keep it all neat, and the chevrons are the pad stitching. 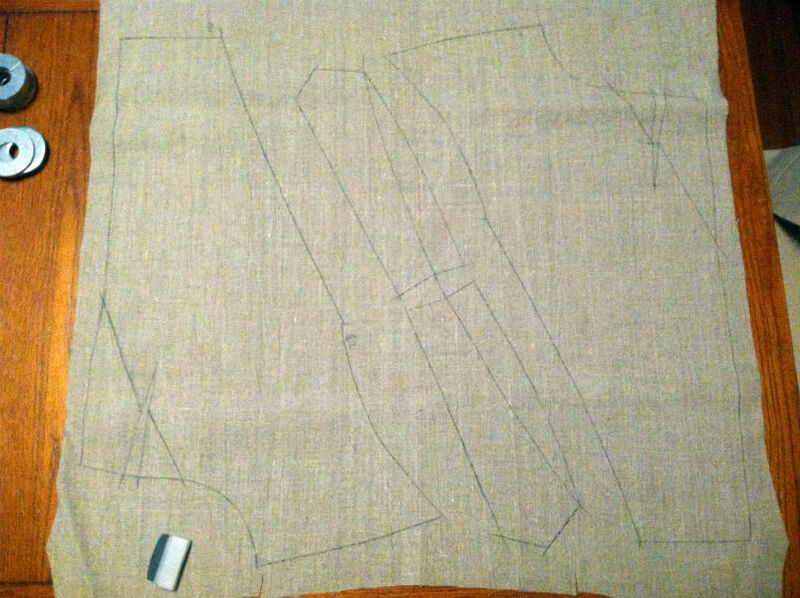 Next, I laid out my pattern pieces on the fabric. You can't see it in this photo, but the next couple will show off the true pattern and colour of the linen. 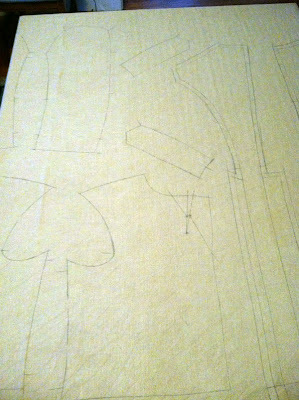 I've seen many different methods of pad stitching or otherwise attaching the canvas to the undercollar. 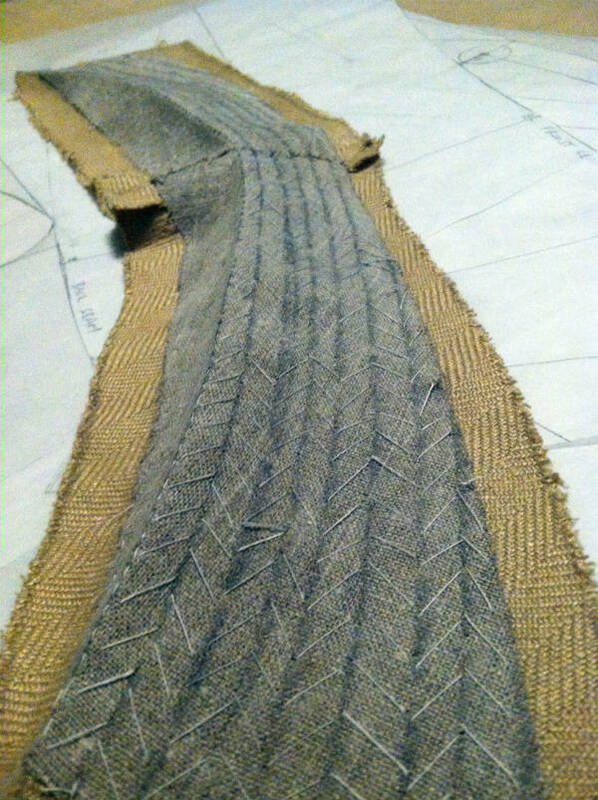 I went with Maclochlainn on this one, which has you pad stitch the collar part, and side stitch the stand. You can't really see the side stitching in this photo because the stitches are small, but it does add body to the stand. Here I haven't ironed the fall line yet - just pressed it with my fingers - but it gives a good idea of how the collar will fall. 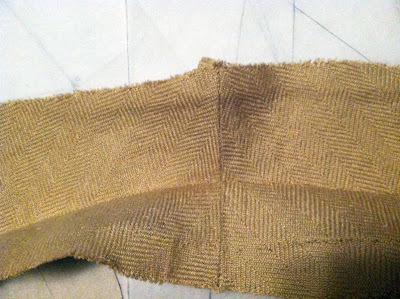 This was a lucky break - I didn't even plan it because I completely forgot to think about it, but the herringbones lined up perfectly where the undercollar seam is, to form a chevron. Actually, now that I look at it again you can see that the grains are reversed. Ah well, you'll never see this part of the collar anyway. Even though you can't see any of the thread from the pad stitching. I have just come across your Blog and simply want to say thanks! It's a great source of information and inspiration for those of us (especially men) who are interested in the craft of tailoring. Your posts are great! Photos, narrative, suggestions, details.... I'm looking forward to reading all your past posts and seeing what great projects you present in the future. Thank you very much for sharing your skills and interests. Thanks, Bobbin Doctor! 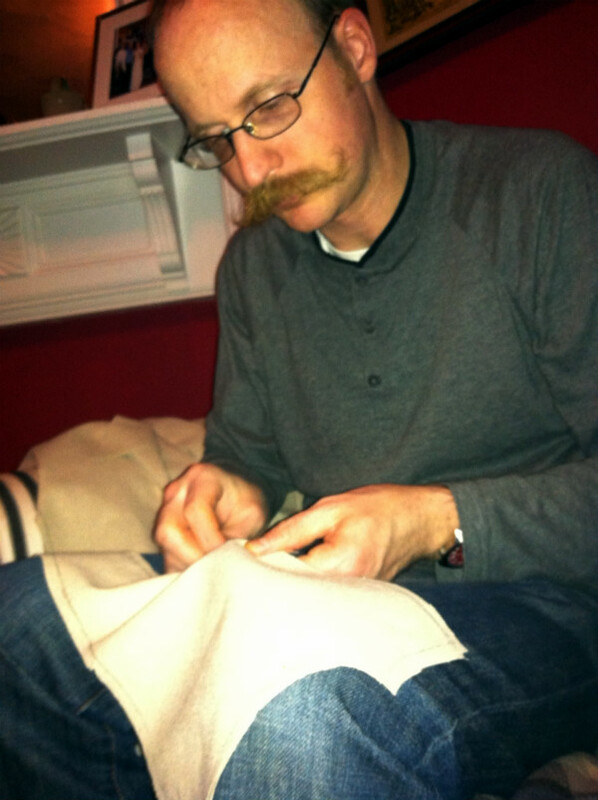 It's rare to find men who are sewing on the Internet. While on a search for a tailor's square at the now out of business greenberg and hammer I came across a comment suggesting richard the thread for corset supplies. In their catalog, they sell period patterns including Victorian. 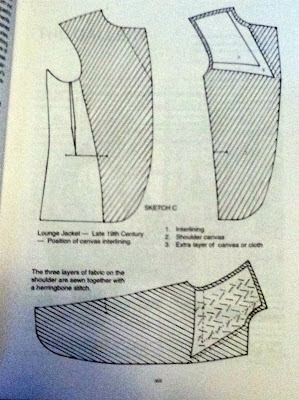 May I recommend Donald H. McCunn's How To Make Sewing Patterns which features a good 7 pages on drafting and fitting the man's suit jacket. Collar variations are also covered in another chapter of almost ten pages. 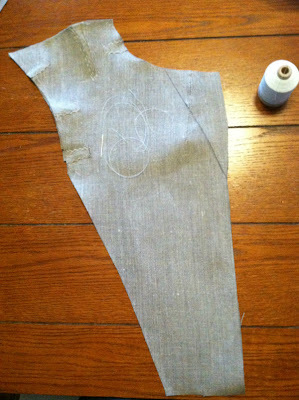 Also, instructions in making a matboard dress form which includes the length of the neck, using your sloper as a pattern. You might find in library or online shops. He also has an web address. The 3rd edition I have is from 1980 and purchased at yard sale for 1.00! I admire the work you are doing and have purchased Mr. Doyle's fine books. Thank you, Carol. I'll definitely check out that book. 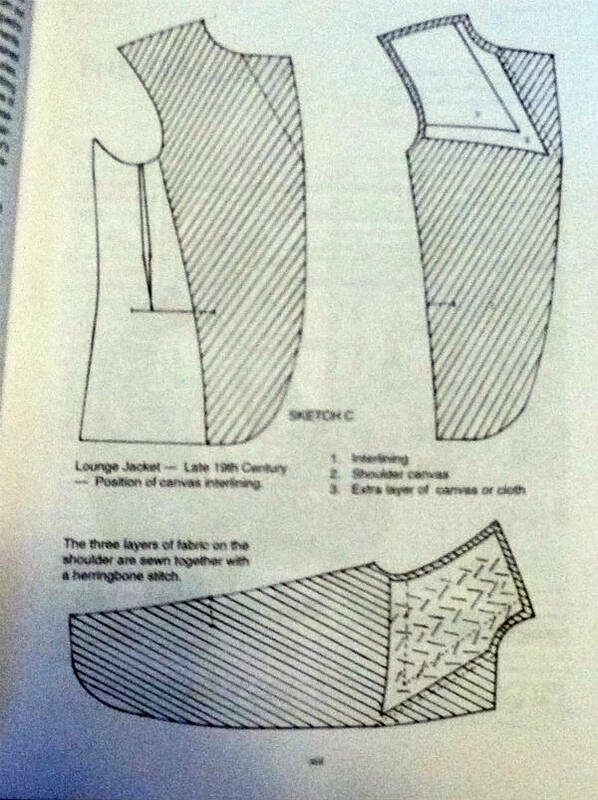 It's funny, while I'm most interested in Victorian tailoring, I'm finding more and more that at least for the coat, not much has changed between 1890 and today in terms of making a tailored sport coat (in 1890 referred to as a lounge jacket). Even if you use a sewing machine for the major seams, you'll only really save yourself an hour at most of the 70 hours or so you'll spend working on the guts and facings.